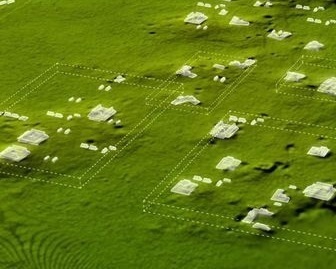 "Laser Scans Reveal 60,000 Hidden Maya Structures in Guatemala"
“With the help of a pioneering laser-mapping technology, researchers have made a major archaeological discovery in Guatemala. According to Tom Clynes, who broke the story in a National Geographic exclusive published last week, more than 60,000 Maya structures—among them houses, fortifications, and causeways—have been identified amid the jungles of the Petén region, shaking up what experts thought they knew about the complexity and scope of Maya civilization. The breakthrough discovery was made using Light Detection and Ranging, or LiDAR, which works by beaming millions of laser pulses from a plane to the ground below. As the wavelengths bounce back, they are measured to create detailed topographical maps. In Guatemala, LiDAR allowed a team of researchers, supported by the PACUNAM Foundation, to map more than 800 square miles of land obscured by dense foliage. "I think this is one of the greatest advances in over 150 years of Maya archaeology," as Brown University archaeologist Stephen Houston, who collaborated on the project, put it in an interview with the BBC. Researchers have long thought that Maya cities were largely isolated and self-sustaining. But the LiDAR scans indicate that the Maya civilization was in fact interconnected and sophisticated, not unlike the ancient civilizations of Greece and China. For example, the team discovered a network of wide, elevated causeways that linked Maya cities and may have been used to facilitate trade between different regions. The scans also suggest that the Maya civilization was much larger than previously believed; estimates had placed the population at around 5 million during the Maya classical period, which spanned from about 250-900 A.D. But the new data suggests that the population may have been as large as 10 to 15 million people, “including many living in low-lying, swampy areas that many of us had thought uninhabitable,” as National Geographic Explorer Francisco Estrada-Belli, who was also affiliated with the project, tells Clynes. Most of the newly discovered structures appear to be stone platforms that would have supported the pole-and-thatch homes that most Maya lived in, according to Stephanie Pappas of Live Science. The survey also revealed a surprising number of defense systems from walls, to ramparts, to fortresses. Some of the land mapped with LiDAR technology was unexplored. Other spots had been excavated previously, but LiDAR helped reveal features that archaeologists were not able to see, including a seven-story pyramid covered in vegetation. Archaeologist Tom Garrison tells Pappas of Live Science that the new maps also pointed experts toward a 30-foot fortification wall at a site called El Zotz. "I was within about 150 feet of it in 2010 and didn't see anything," he says. As you become one of the elders you gain a fondness for stories and thinking about past memories. After leaving the Navy and pronouncing myself an art dealer in 1974, I was seriously out of my league having had a total academic career of three weeks of art history at Tulane University. John Lunsford, Bob Armstrong, Roy Sieber, and Ray Wielgus saw something that motivated them to help me out. I spent hours with Roy Sieber learning and listening as he inspired me to work harder to catch up. On one occasion I sent Sieber the picture of a beautifully carved Mossi Wango mask. Roy immediately responded saying that he had a young graduate student currently working in the field in Burkina Faso and would send him the photo. This was my first introduction to Chris Roy and a friendship that would last over 40 years. Chris responded immediately with the name of the carver and a pronouncement that my "masterpiece" was made for sale. I, of course, was shocked and turned to Sieber saying that this was not possible as the mask was too beautiful. Roy's response has stayed with me throughout my career. " John you should like it, it was made for you." As different as Chris and I were both academically and poiltically, we definitely got each other as a result of shared experiences. Chris graduated from Phillips Exeter Academy in 1965 while I completed four years at nearby Williston Academy in Easthampton, Mass in 1963. Our two schools competed against one another and trust me boarding school in the 1960's tends to be a bonding experience. I made a number of trips to Iowa in the 1970s, 80's and 90's and became good friends with Chris and Nora. I do remember some nice visits to Iowa City and spending some time bantering with Nora on our very diverse political theories. It was great fun and an opportunity to work with Chris and to show him my latest African finds. When it wasn't cool Chris and I both loved the art from what was then Upper Volta and is now Burkina Faso. In 1992 Chris became the Mellon Adjunct Curator of African Art at the The Dallas Museum of Art. This position required Roy to make monthly trips to Dallas to curate the museum's collection. In 1994 Chris was faced with a major decision. Jean Paul Barbier, a very powerful tribal art collector from Geneva and friend of Margaret McDermott who was the Dallas Museum's most important patron, offered his West Africa gold collection to the museum. As museum's African curator, the decision fell to Chris whether to recommend the purchase. Roy knew exactly what he was going to do; however, we discussed it and agreed the only course was to be honest and ignore the obvious pressure. Chris Roy acknowledged that the collection was just not good enough for the museum and he did not support the acquisition. While there was no stated quid pro quo Chris was asked to leave the museum in 1994. Regardless of how this went down, we do know that Chris Roy showed his true character when he did what he did. And this we should celebrate. I hope to stay in touch with Nora and will with the help of friends create an appropriate way for the museum in Iowa City on campus to honor Chris. If you are interested in participating contact me. I already miss Chris and his booming laugh and very wry sense of humor. We laughed a lot and shared many adventures. Losing that leaves a big hole in anybody's life. I have reprinted Chris’ CV in its long form so that we may all appreciate what a major contribution he made to African Art. Education: St. Lawrence University, Canton, New York. B.A., 1970 . Indiana University, Bloomington, Indiana, Department of Fine Arts. Assistant Professor (1979), Associate Professor (1984, with tenure). 1992-94 Mellon Adjunct Curator of African Art, The Dallas Museum of Art. industry and its impact on art (Development assignment). industry and its impact on art. Fulbe people in the village of Dori. 1987 Art of the Upper Volta Rivers. Meudon: Alain and Francoise Chaffin. Art from the Bareiss Collection. Hannover: The Kestner Gesellschaft. 1988 Selections from the Julian and Irma Brody Collection (guest curator). The Des Moines Art Center. 1995 “Art of Ancient Africa" (Ch. 13) and "Art of Africa in the Modern Era"
N. Abrams, 1st and 2nd editions. film these in Africa and edit them in my office at Iowa. Burkina Faso, where most of them were made. smelt iron, forge tools, and watch the Baga diviner perform. opposite clan, and the winners' names are remembered for years to come. of leaves, which is worn for one day and then destroyed. 1 hour. watch the people of the village interact with the masks. 1 hour. efficient techniques African smiths once used. supernatural spirits that protect the community. distinguished career as chief and as a colonel in the armed forces of Ghana. state, drums, dancing, and both military and Christian rites. 1998. Funded by Fund for Improvement for Post-Secondary Education. Iowa City: The Project for Advanced Study of Art and Life in Africa. City: The Project for Advanced Study of Art and Life in Africa. Advanced Study of Art and Life in Africa. 1999 “Kilengi: African Art from the Bareiss Collection,” (exhibition preview). 1983 "African Art in the Stanley Collection," African Arts 16(3):32-46,79. 1982 "Mossi Weaving," African Arts 15(3):48-59,91-92. 1982 "Mossi Chiefs' Figures," African Arts 15(4):5259,90-91. 1981 "Mossi Dolls," African Arts 14(4):47-51,88. 1980 "Mossi Zazaido," African Arts 13(3):42-45,92.
editor See the Music, Hear the Dance. Baltimore Museum of Art. 2003 “Leaf Masks Among the Bobo and the Bwa,” in Herreman, Frank, ed. Center for International and Comparative Studies. 1985 101 Masterworks: The University of Iowa Museum of Art. Iowa City. Traveling Exhibition Service exhibition and publication Generations. (winter 1983):9-23; 49 (spring 1984)22. 1984 "Mossi Mask Styles," Iowa Studies in African Art 1: 45-66. Moines Art Center, there are essays on each of the parts of the collection. around the world, published in Oxford, GB. Editors Joann Eicher U.
Festchrift for Karl Ferdinand Schaedler. Rahden:Verlag Marie Leidorf. and Robert van Dijk. Rotterdam: 1980. African Arts 15(4):17-21. 1981. African Arts 15 (2):10-17. 1980 "Traditional Sculpture from Upper Volta," African Arts 13(2):74. Collection. Iowa City: The University of Iowa Museum of Art. Collections. Iowa City: The University of Iowa Museum of Art. China. Chief curator and author, With Allen F. Roberts. University of Iowa Museum of Art. course in the fall of 2005, 2006.
support totaling over $1,500,000 since 1978. 1999-00 Art and Humanities Initiative grant $3,000 to duplicate research photos. teachers to use it. Project Director. program titled "Art and Life in Africa" for use in collegelevel classes on African art. Completed October, 1998. Museum of African Art (summer). prize for creative excellence at a major national video conference). 1983, 1984, 1985 (a semester each year for three years). Faso on "The Art of the Mossi and their Neighbors". Council and the American Council of Learned Societies. study of the More language. 2000 College of Liberal Arts, Collegiate Teaching Award. 1983 “Mossi Art and History,” University of Ouagadougou, history seminar. Annual Meeting of the African Studies Association, Washington. The Virginia Museum of Art, Richmond. Triennial Symposium on African Art. 1998 “Invented Spirits and Art in Burkina Faso,” Washington University, St.
African-American Art, Dallas Museum of Art. Worcester, Mass, Lakeview Museum, Peoria Illinois. 1989 “Signs and Symbols in Voltaic Art,” The Center for African Art, N.Y.
1984 “Art and Death in a Mossi Village,” University of California/ Santa Cruz. 1984 “Mask Styles of Burkina Faso,” Friends of Ethnic Art, San Francisco. African Studies Association Annual Meeting. New York, Department of Fine Arts. African Studies Association Annual Meeting. Panel Chair. 1982 “Mask Styles of Upper Volta,” University of California, Los Angeles. School of Art, Art History, and Design. “Individual Works of African Art” chaired by Suzanne Blier. Georgia, Fifth Triennial Symposium on African Art. Studies Association Annual Meeting. Panel Chair. Art History, Symposium on African Art. opening of objects from the Stanley Collection). Association Annual Meeting, Panel on “Art and Religious Ritual”. 1998- 2000 Web-master, art history program. and Art History, University of Iowa. most between 1978 and 1982. 1995- present Adjunct Curator of Tribal Art, The University of Iowa Museum of Art. 1991-92 Chair of Foreign Civilization and Culture Coordinating Committee. Iowa, "Art and Initiation in Zaire"
1984-86 University of Iowa Committee on Foreign Languages. "The Artist and the Workshop in Traditional Africa"
1984-85 Committee for a Center for Advanced Studies at the University of Iowa. 47:7 "Contemporary Africa," 3 s.h. (Global Studies Program), an interdisciplinary introduction to Africa offered in 1979, 1981, 1982. Organized 47:110 "African News Colloquium," offered in 1983, 1984. Technology," New Orleans, Triennial Symposium on African Art. hosted by The University of Iowa, April 23-25, 1992. 1989-1999 Consulting Editor, African Arts, U.C.L.A. 1980 Chairman of a panel on "Recent Research on Traditional Masking, "
for the Humanities. With L. Lee McIntyre. "Masterpiece or Mistake? A Hawaii Museum’s $7.5 Million Question"
“A statue of a Hawaiian war god bought at auction for about $7.5 million is now the centerpiece of a major exhibition in Honolulu. But some experts say it might not be as old, or as valuable, as the auction house claimed. It was a generous gift — and one completely in tune with our cultural times. In 2018, the tech billionaire Marc Benioff donated a wooden statue of a Hawaiian war god he had bought at auction for about $7.5 million to the Bernice Pauahi Bishop Museum in Honolulu. The snarling, musclebound deity, known as “The Island Eater,” is now the centerpiece of a major exhibition there, exploring the role of traditional sculpture in Hawaiian culture and society. This private act of restitution came amid a growing clamor for Western collections to return ethnographic artifacts to their places of origin. At the sale in Paris, Christie’s said the wooden war god was about 200 years old. But now doubts have emerged about the sculpture’s age, inside and outside the Bishop Museum. Some international experts say the piece could be from the 20th century and worth less than $5,000. “It’s the sort of thing you see in a tiki bar,” said Daniel Blau, an expert in the art of the Pacific islands who is based in Munich. Such a wide discrepancy in valuation could be a concern for the Internal Revenue Service, should Mr. Benioff wish to claim the donation on his tax return, as well for museumgoers having to pay as much as $24.95 to see the sculpture in Honolulu. Mr. Benioff, who would not comment for this article, currently has a net worth of about $6.8 billion, according to Forbes. In September, he bought Time magazine for $190 million. He strongly identifies with the spiritual values of Hawaii, where he owns a six-bedroom beachfront house. His desire to infuse the corporate culture of Salesforce with the “Aloha spirit” — including turning his employees’ Fridays into Hawaiian shirt days — has, however, led to accusations of cultural appropriation. Now questions are being asked about Mr. Benioff’s act of cultural repatriation. The Christie’s sale in Paris was the last of several from the fabled private collection of Pierre Vérité and his son Claude, both highly regarded dealers in tribal art. The elder Mr. Vérité had the distinction of selling artifacts to Pablo Picasso, Henri Matisse and André Breton, among others. Lot 153 in Christie’s sale was cataloged as “Hawaiian figure, kona style, circa 1780-1820, representing the god of war, ku ka ’ili moku.” Hitherto unknown, with no documented history of ownership, the 21-inch sculpture, carved from wood of the Hawaiian metrosideros tree, was thought to have been acquired by Pierre Vérité from the dealer and collector Marie-Ange Ciolkowska during the 1940s, according to Christie’s. It was estimated to sell for 2 million to 3 million euros, or $2.3 million to $3.4 million. Anthony Meyer, a dealer based in Paris and a specialist in Oceanic artworks, said “I don’t think it’s a pre-contact or post-contact sculpture carved by someone with the belief systems of that period or place,” referring to Captain James Cook’s arrival in Hawaii in 1778. “I think it’s made later, but I don’t know when,” added Mr. Meyer. He added that if the sculpture is of a much later date, it could have a financial value of less than $5,000. 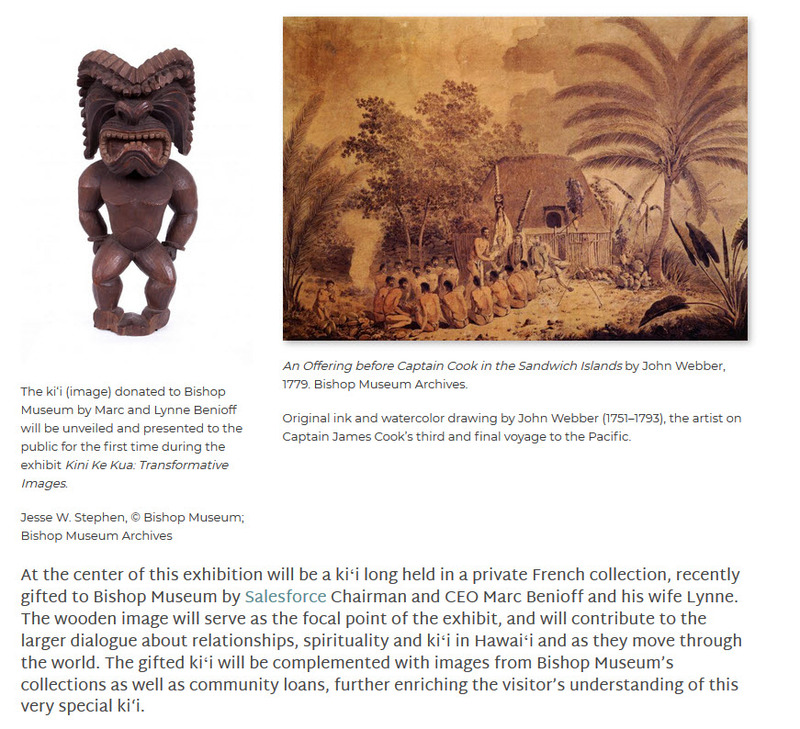 Mr. Harding said he had told Christie’s before the sale that the sculpture was the “mate” of a similar-looking figure made from the same type of wood in the British Museum; records show that sculpture was acquired by the London Missionary Society in Hawaii in 1822. George Bennet, a voracious collector, was on that voyage, and Mr. Harding believes that the figure sold at Christie’s was very likely from his personal collection. “I’m 90 percent sure it’s a Bennet piece,” Mr. Harding said. This provenance, “George Bennet collection, London,” which has no documentary corroboration, was included in marketing materials from Christie’s. Last fall, a fact-finding delegation of curators from the Bishop Museum visited experts in London and Paris, including Mr. Meyer, to investigate the history of the sculpture. The museum’s current “Transformative Images” exhibition, in which the figure is on show, presents it cautiously, describing it as “long held in a private French collection,” but not specifying when it was carved. Mr. Blau and other experts point out that radiocarbon testing can narrow down the age of the wood, but not when it was carved. A spokeswoman for Christie’s said Dr. Kaeppler had only seen photographs of the sculpture and had not viewed it person. The issue could be given closure if Mr. Benioff were to claim a charitable tax deduction for his $7.5 million donation to the Bishop Museum. Having been bought at auction for more than $50,000, the sculpture would have to be appraised by the I.R.S. Art Advisory Panel, which would recommend a true market value. But Mr. Shapiro also pointed out that donated artworks generally qualify for significant tax deductions only if they have been owned by a collector for at least a year. This was not the case with Mr. Benioff’s Hawaiian sculpture. Mr. Benioff said through a Salesforce spokeswoman that he would not comment for this article, and did not respond to further emails asking if he intended his gift to be tax-deductible. "Colorful, Contemporary South African Beadworks Express Story of Tragedy, Hope and Healing"
“Experience the color and shine of intricate beaded artworks in Ubuhle Women: Beadwork and the Art of Independence. On view at the Chrysler Museum of Art from Oct. 18, 2018–Feb. 24, 2019, the exhibition showcases a new form of textile art known as the ndwango and presents a story of rural South African women overcoming hardships and illness to achieve artistic significance and economic independence. Beadwork is a customary form of artistic expression for South African women and is passed down through the generations. Ubuhle Women was established by Ntombephi Ntobela and Bev Gibson in 1999 on a former sugar plantation in KwaZulu-Natal. It created employment for rural women using the traditional skills many of them already possessed. The plain black fabric that serves as the foundation for the Ubuhle Women’s exquisite beadwork is reminiscent of the Xhosa headscarves and skirts many of the women wore growing up. The artists stretch this textile like a canvas and use colored Czech glass beads to transform the flat cloth into a contemporary art form of remarkable visual depth. Gibson, the visionary of the traveling exhibition, says “the works are so beautiful, there’s nothing to understand.” Ntobela says the women work in their own unique style “directly from the soul” to create abstract and figurative subjects for their ndwangos. 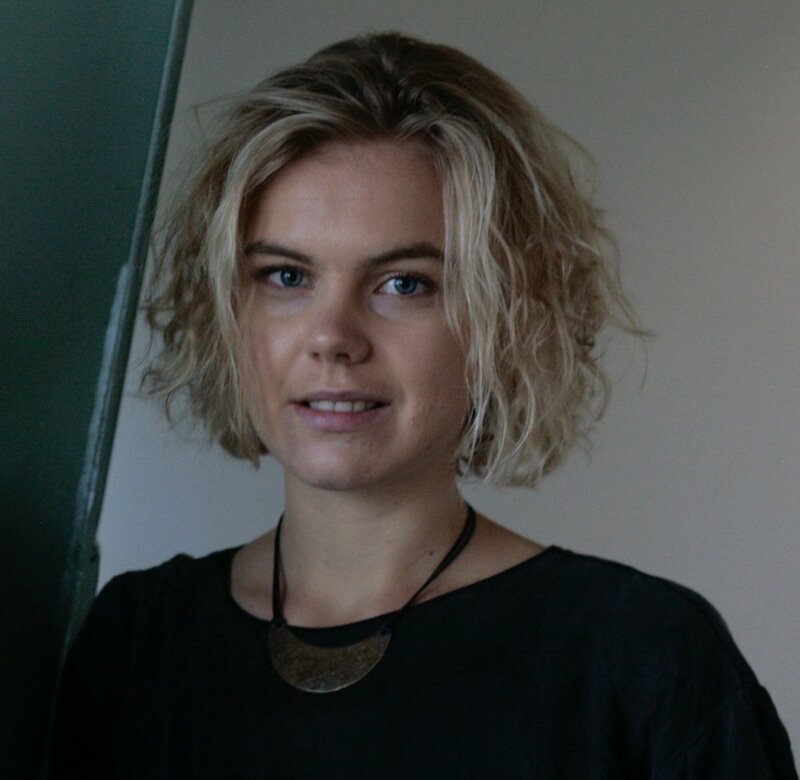 “There are fascinating, culturally specific elements in these artworks like patterning influenced by traditional Zulu and Xosa clothing and adornment as well as imagery and subject matter that speak to a universal humanity that we all share and can relate to. No matter who we are, we can identify with a person’s sorrow, joy, hopes and journeys of healing,” said Carolyn Swan Needell, Ph.D., the Chrysler Museum’s Carolyn and Richard Barry Curator of Glass. Remembering the dead is a key motivation for the creation of many of these artworks, and it imbues them with a spiritual significance. Since 2006, the Ubuhle community has lost five artists to HIV/AIDS, diabetes, cancer and other illnesses, nearly halving the number of active artists. Many of the ndwangos function as memorials to Ubuhle sisters who have lost their lives. Due to the slow, meticulous process of creating the ndwango, the act of beading becomes a form of therapy. It is a way of setting down the issues that are closest to the artists’ hearts, a way of grieving and a place to encode feelings and memories. “The ndwango as a medium might be considered a ‘portrait’ of each artist as every work is a deeply personal recording that captures the artist’s experiences as well as her distinctive style of working and signature colors, patterns and imagery,” said Swan Needell. Ubuhle means “beauty” in the Xhosa and Zulu languages and aptly describes the shimmering quality of light on glass, which has a particular spiritual significance for the Xhosa people. From a distance, each panel of an ndwango seems to present a continuous surface, but as the viewer moves closer and each tiny bead catches the light, the meticulous skill and labor that went into each work becomes stunningly apparent, as does the sheer scale of artistic ambition. A single panel can take more than 10 months to complete. Four ndwangos with imagery of South African breeds of cattle such as Boran, Ankoli and Nguni are among the exhibition highlights. Each represents an actual animal studied by the artist. The bulls and cows remind the women of their fathers, mothers, grandmothers and sisters while the color palette and patterns reflect personal traits like strength, courage, energy, dignity and love. Another highlight from the exhibition is the monumental artwork The African Crucifixion. Although telling a biblical story, the crucifixion of Christ is seen through the eyes of a community of women who are dealing with the key issues of 21st-century life in rural South Africa — health, food, water, employment and security. "King Tutankhamun’s treasures come to London's Saatchi Gallery before returning to Egypt forever"
“150 ancient artefacts will be displayed in a major exhibition commemorating the centenary of the discovery of the pharaoh’s tomb. The largest collection of the pharaoh Tutankhamun’s treasures to ever travel out of Egypt will come to the Saatchi Gallery in London later this year. Tutankhamun: Treasures of the Golden Pharaoh (2 November 2019-3 May 2020) will commemorate the centenary of the discovery of the ancient-Egyptian ruler’s tomb with original 150 artefacts to go on display, 60 of which have never travelled outside of Egypt. This will be the third leg of the show, which opened in March 2018 at the California Science Centre in Los Angeles before travelling to La Grande Halle de la Villette in Paris (1 March-31 September). The exhibition will tour 10 cities in total. A spokeswoman was unable to disclose which cities the exhibition will travel to after London. Among the exhibited works will be a golden canopic coffinette used to house Tuttenkhamun’s mummified stomach, and a 5cm-tall golden statue (1336-1326BC) which contemporary scholars now believe to be a likeness for Tutanhkhamun rather than his grandfather as was originally thought. These ancient artefacts, which were housed in the nearly-intact tomb of the boy king Tutankhamun, were discovered in 1922 by the British archaeologist Howard Carter. Previous exhibitions in London have drawn record crowds of over one million visitors each in both 1972 and 2007. Both these shows contained less than 55 artefacts from the tomb, roughly a third of the number of works which will be displayed in this exhibition. The proceeds from this exhibition will help support the new Grand Egyptian Museum in Cairo which is expected to open in 2020. Upon the show’s conclusion, Tutankhamun's artefacts will return to Egypt and be permanently displayed in the museum. The exhibition will consist of nine immersive galleries incorporating digital content and audio which "will follow Tutankhamun's passage into everlasting life". Dr Mostafa Waziry, the secretary general of the ministry of state for antiquities in Egypt, says, “to celebrate the 100th year anniversary of the discovery of Tutankhamun’s tomb, Egypt is sending 150 masterpieces to tour all over the world. Please see them, visit them, before they return back to Egypt forever." "Met Hands Over an Egyptian Coffin that it Says Was Looted"
Less than two years after an acquisition, the Metropolitan Museum of Art announced today that it had handed over a first-century BC gilded coffin to the Manhattan district attorney for return to the Egyptian government after discovering that it had been looted in 2011. The Met’s statement said it had been “fully cooperative” in recent months with an investigation by the district attorney’s office into the coffin’s origins. The museum acquired the coffin of Nedjemankh, which was until this week the centrepiece of a Met exhibition, in July 2017 from what it then described as a private collection. The institution says it now realises that it was given a fraudulent ownership history as well as a forged 1971 Egyptian export license for the coffin. A Met spokesman says the coffin was purchased from the Paris-based dealer Christophe Kunicki for €3.5m. He says that the museum is pursuing a "variety of remedies" against the dealer and that the coffin was delivered to the district attorney's office today. A man who answered the telephone at a number listed for Kunicki in Paris and who declined to identify himself beyond saying he was speaking for "Mr. Kunicki’s office” said that the dealer had just learned about the Met’s announcement in an email. He confirmed that the coffin was purchased from a private collection but declined to identify it. “Now we are going to call our lawyer,” he said. The discovery that the coffin was looted raises questions about the scrutiny that exported treasures undergo during the Met’s acquisition process. The museum emphasised in its statement that all of the Met’s acquisitions undergo “a rigorous vetting process” in line with a 1970 Unesco treaty, federal and state laws and the Association of Art Museum Directors’ guidelines on the acquisition of ancient art and archaeological materials. He said the museum “must be a leader among our peers in the respect for cultural property and in the rigour and transparency of the policy and practices that we follow”. "Possible Maya Steam Bath Found In Guatemala"
"What Made this Ancient Society Sacrifice its Own Children?" “Some 500 years ago, the Chimú in what is now Peru ritually killed hundreds of their young in the largest mass child sacrifice events known in world history. Now archaeologists are trying to understand why. “Trenches Ecuador Santa Ana La Florida Block Real(Courtesy Michael Blake, The University of British Columbia; Courtesy Sonia Zarrillo) Hearth and tomb, Santa Ana-La Florida, Ecuador Cacao seeds, the raw material used to make chocolate, were being consumed in southeastern Ecuador much earlier than archaeologists have thought. The evidence comes from chemical analysis of bottles found at an ancient village now called Santa Ana-La Florida. "We were surprised at how clear the evidence of cacao use is 5,300 years ago and that it continues throughout the 3,000-year history of the site," says archaeologist Michael Blake of the University of British Columbia. "Unpacking Medieval African Art's Profound Global Legacy"
Although several decades of archaeological and paleontological excavations have proven that life on this planet began in Africa, by and large, the continent has remained shrouded in a myopically dense, Eurocentric fog. Accounts of the existence of major cities and empires in Africa during the Middle Ages and before—including Kush in present-day southern Egypt and central Sudan, Axum in what is now Ethiopia, and Great Zimbabwe in modern-day Zimbabwe—are myriad. The legacy of colonialism, however, often overshadows more than a millennia of African history. A new exhibition at the Mary and Leigh Block Museum of Art at Northwestern University aims to shine a light on Africa’s significant connections to and influence on the economy and material culture of the world—centuries before the calamitous brutality of imperialism and the transatlantic slave trade. Opening on January 26th, “Caravans of Gold, Fragments in Time: Art, Culture and Exchange Across Medieval Saharan Africa” shifts the line of inquiry to center medieval Africa’s global influence through trans-Saharan trade networks in Europe, the Middle East, and Asia prior to the development of the slave trade. Dr. Kathleen Berzock, the Block’s associate director of curatorial affairs, organized the exhibition through cross-disciplinary partnerships with the Buffett Institute for Global Studies at Northwestern, as well as with historians, archaeologists, and anthropologists in Mali, Morocco, and Nigeria. Before now, the breadth of medieval Africa’s reach has been all but untapped in art-historical discourse. The majority of exhibitions have not highlighted the ways in which African material cultures had strong connections to economies and cultural production in other parts of the world. Objects like an ivory Madonna figurine from 12th-century France—carved from the tusks of African Savannah elephants—take on new resonance in the context of the trans-Saharan trade route. So does an extremely intricate 15th-century lost-wax cast from Nigeria, made of copper from the Alpine region. Such objects unequivocally establish Africa’s status as a global commercial center, and illustrate partnerships based on mutual benefit, rather than relationships marred by unequal exchange. Among the most interesting fragments in the show is a Qingbai pottery shard made of Chinese porcelain unearthed at Tadmekka in Mali. With more than 6,000 miles between these two regions, the shard shows precisely how vast and intricate medieval trade networks across the Sahara were. Spices, copper, ivory, gold, salt, and other commodities made West Africa a region of renown across the medieval world. A map from 14th-century Catalonia in present-day Spain prominently featuring Mansā Mūsā, or Mūsā Keita I, the ruler of Mali, denotes that Europeans took notice of the empire early on. Said to be the richest person to have ever lived—a feat even for modern standards—Mansā Mūsā presided over 1,200 miles of land; his empire included much of present-day Burkina Faso, Chad, Gambia, Guinea, Mali, Mauritania, Niger, Nigeria, and Senegal, and was peppered with plentiful gold and salt mines at a time of decline in European production. From 1324 to 1325, the Muslim leader voyaged from Timbuktu to Mecca on the hajj, setting out with a convoy of 15,000 subjects. According to contemporary accounts, the caravan was as long as the eye could see. Along the journey, the emperor lavished gifts of gold on everyone he met, strategically establishing key diplomatic relationships. Reports of Mansā Mūsā’s fantastic wealth made their way to Europe, and Mansā Mūsā and the Mali kingdom were quite literally put on the map in 1339. Algerian scholar Tahar Abbou writes that among the consequences of Mansā’s journey was that it “stirred the European ambitions” to explore Africa in search of Mansā’s gold source, bypassing the North African merchants who had previously acted as middlemen in the trans-Saharan trade. Amid tense calls from contemporary African leaders for Western museums to return looted artifacts, the Block Museum chose to collaborate with African institutions like the Musée National and L’Institut des Sciences Humaines in Mali and the National Commission for Museums and Monuments in Nigeria. Their efforts brought an unprecedented trove of items as-yet unseen outside of Africa to the exhibition. Highlights range from a delicate, indigo-dyed woven fabric thought to be among the oldest existing African textiles, to terracotta and bronze sculptures predating the famed Benin bronzes.